At waypoint 501 which is only 1 km from the western boundary of the Kruger Park I crossed the N’Waswitsontso Dry River bed close to its point of origin. 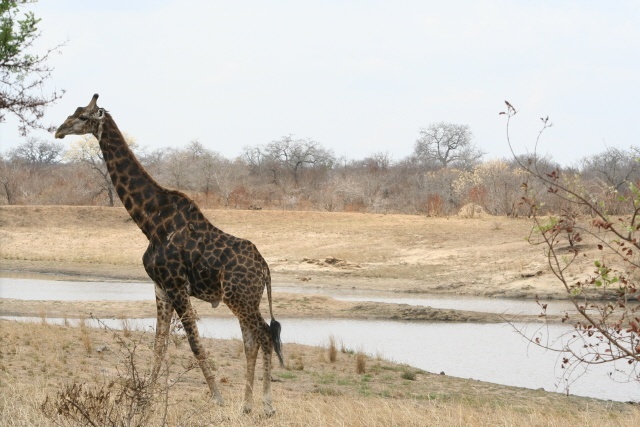 This river is an important tributary of the Komati River and flows from here right across the centre of the Kruger National Park for more than 100 kms. It is a river that flows intermittently before disappearing but continuing to flow under the ground thereby forming occasional pools along its length. I would skirt this river all the way to the main tar road H1-3. It would be a wonderful river-side drive. 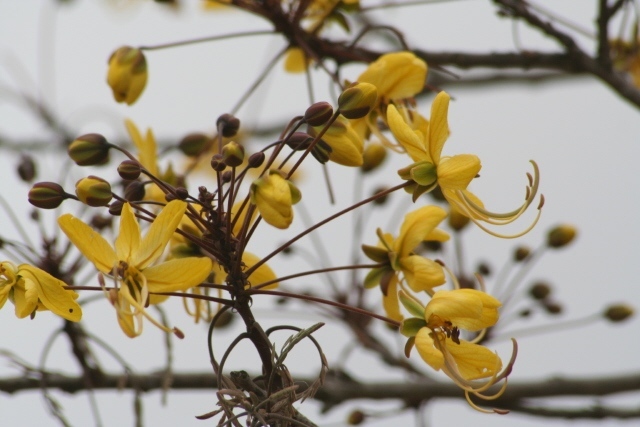 On the drive down to Talamati I saw a number of groups of Zebra, Wildebeest and Impala and the staggering bright yellow colours of the Sjambok Pod tree some bedecked with brand new green leaves were to use the old phrase … “a sight for sore eyes”. Waypoint 502 is the Mahlabyanini watering point which also used to be an Outpost for the early rangers. Passed warthogs close by. It is also where the S140 became the S145 leading up to Talamati Bush Camp. Waypoint 503 is the road leading into the Talamati Bush Camp which looked very pleasant indeed. Just outside the gate was a wonderful pool and there was an observation platform inside the gate that overlooked the water. What a wonderful place to sit with that sundowner. 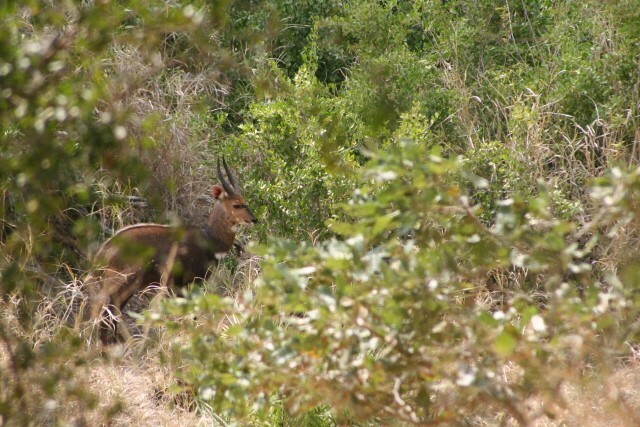 At waypoint 504 is a lovely shady look out point where I saw male and female Nyala. It overlooked the dry (at this point) N’Waswitsontso River. Some beautiful large Sycamore Fig trees were at this point. 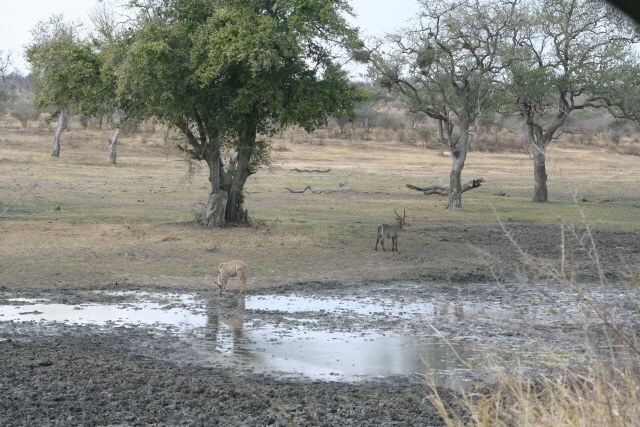 Across the bank in plain view was the dry Thornveld savannah … what an amazing contrast with the riverine vegetation. 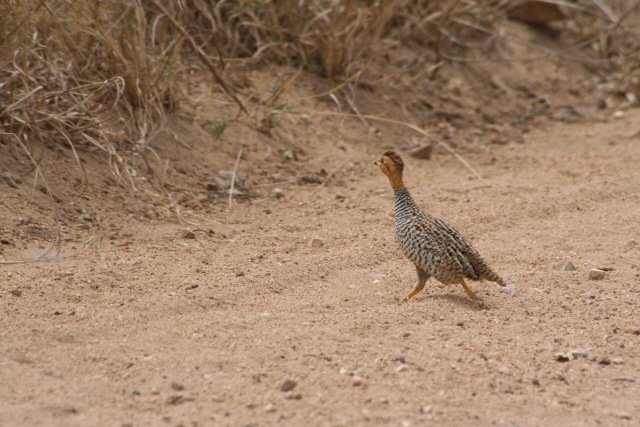 It was here where I also saw my very first ever Coqui Francolin. 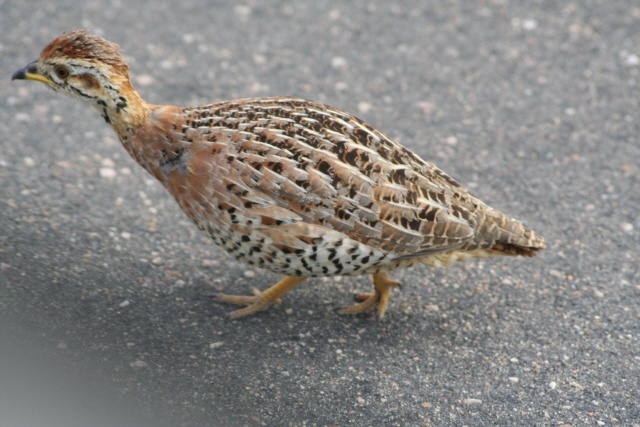 It was on one of those Kruger roads that it would almost be a sin to drive quickly along. 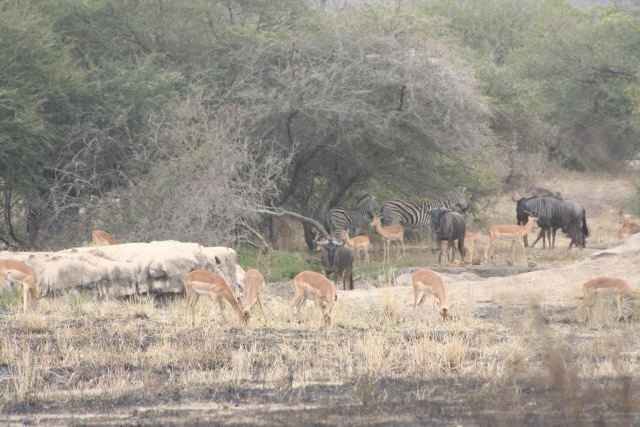 Such were the views and peaceful scenes to be soaked up in the African sunshine. Mix the twisting smooth sand road, hay-coloured grasses, blue skies with soaring raptors, Cassia and Knobthorn blossoming in profusion and you might just be able to picture this scene I was fortunate to behold. Waypoint 505 is the Fairfield watering point sponsored by FNB and at least 2 Warthogs today were grateful for the thirst quenching opportunity. 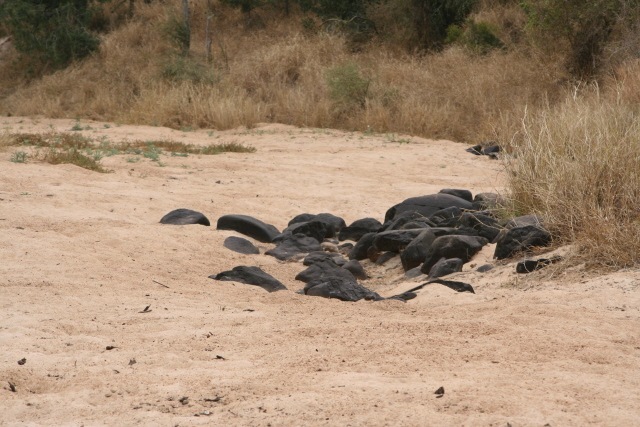 Fresh balls of Elephant dung also left nobody in doubt that Elephants also were grateful to FNB. Waypoint 506 is the intersection with the road to the Hoyo Hoyo Tsonga Lodge and Imbali Safari Lodge and there was also an indicator towards Hamilton's Tented Camp further along the S145. These are all private concessionary lodges and for my money they are probably not worth the premium unless of course you don’t have your own vehicle or have a very short stay. My personal view as to the true secret to seeing the Kruger as it should be seen is not to sit in the back of a vehicle with up to 20 other people but rather to have your own vehicle and get off the main roads, drive slowly and soak up the atmosphere. 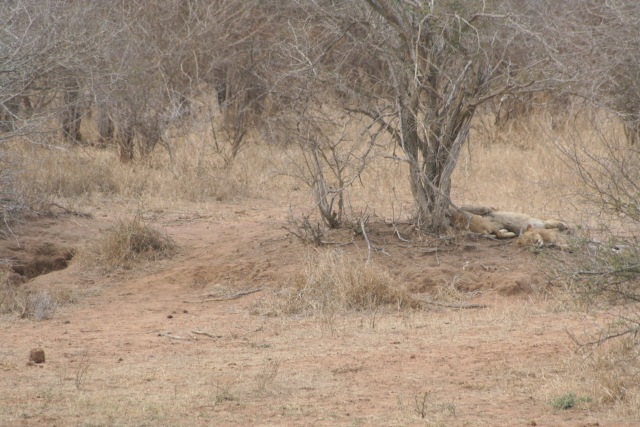 Think of seeing the Big 5 as a true bonus. At waypoint 507 I turned left or north to drive the short road to the Muzandzeni Picnic Spot up the S36 and then reversed the direction to get back onto the S125 traveling south before turning east after a further 6kms along the road. Just before this intersection there was a dry river crossing where jet black rocks contrasted perfectly with the golden sand bed. We had left the riverine area and what an obvious and less interesting drive it suddenly became. 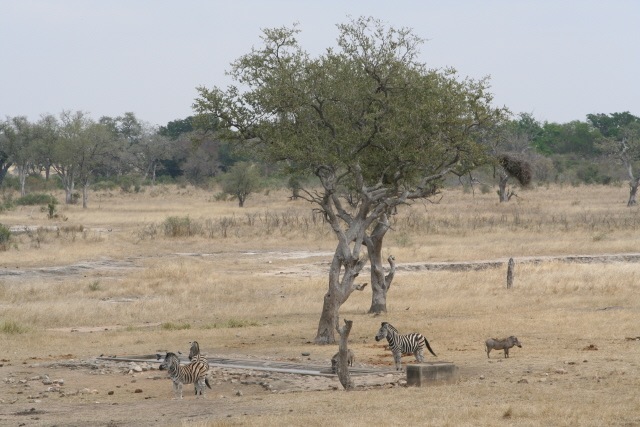 At waypoint 508 was the Shimangwaneni dam (meaning at the Zebra foal) and it was quite low. I stopped to watch one of those dark (old?) Giraffe Bulls amble away from the water’s edge. I made a brief stop at the Picnic Spot after this then returned the way I had come but stopped at waypoint 509 which is the Mondzweni watering point donated also by FNB to watch Zebra and Warthogs at the drinking point in the fairly wide open space surrounding it. I was pleased to get back to the S145 and S36 junction where the road again skirted the N’Waswitsontso River. At waypoint 510 I left the S36 (it carried on to the Nhlanguleni Picnic Spot … “at the magic gwarri”) and turned east onto the S125 which would take me to the main tar road. Shortly after this turn off was the Ngwenyeni watering point donated by Allied Bank staff. Waypoint 513 is a 2 windmill watering point called Mhisanamond named after the mouth of the Mhisana Creek mouth close by. Just after this I saw my second vulture nest of the trip with a single white-headed chick being carefully and lovingly admired by Mrs. Vulture sitting atop the nest of sticks. It was a just a little far away to get a good look. The tree in which the nest was situated was clothed in dark large velvety red Hibiscus type flowers. I was able to get a closer shot of the flower a short distance away where one of these trees provided wonderful shade on the river’s edge. 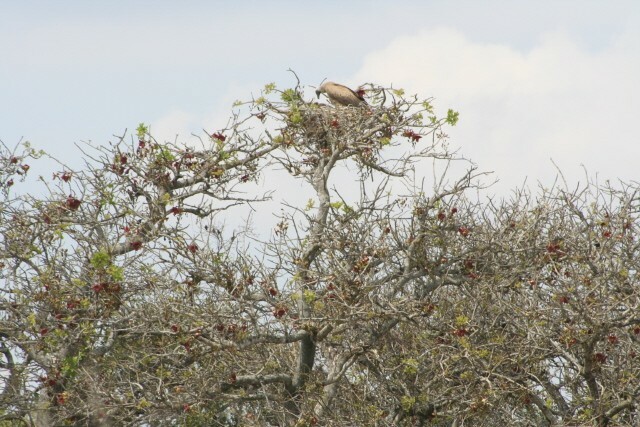 The tree is the well known Sausage Tree (kigelia Africana) or Worsboom. Bats are believed to be the most important pollinators of these trees and the sausage fruit is considered poisonous although used in traditional medicine. 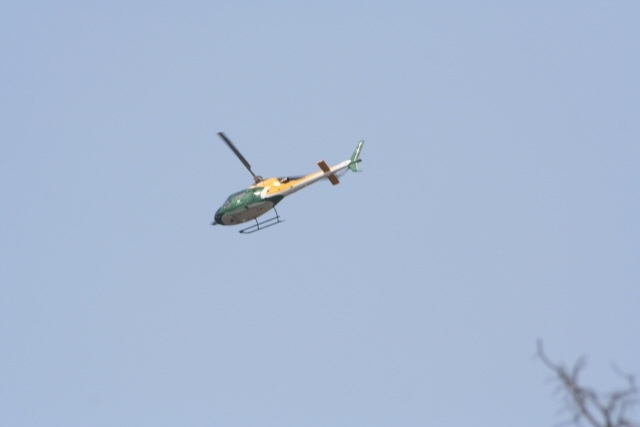 It was here where there was also some action being carried out by the SANParks’ helicopter which was circling in the area. On the banks of he river were a wide enrage of trees and shrubs in blossom some yellow, some bright red (these were probably the Flame Creeper). There were numerous Sausage Trees also in flower. As I got close to the end of the drive (waypoint 514) a car flagged me down to inform me that there were lions alongside the main tar road just north of the junction with the H1-3. Sure enough at waypoint 515 there was a mud hole N’Watinungu. 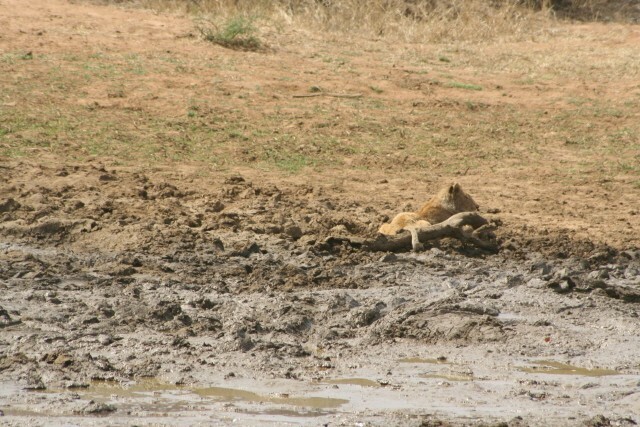 Lying at the edge of the mud was a juvenile lion while 3 more were sleeping under a small thorn tree about 50 metres away. 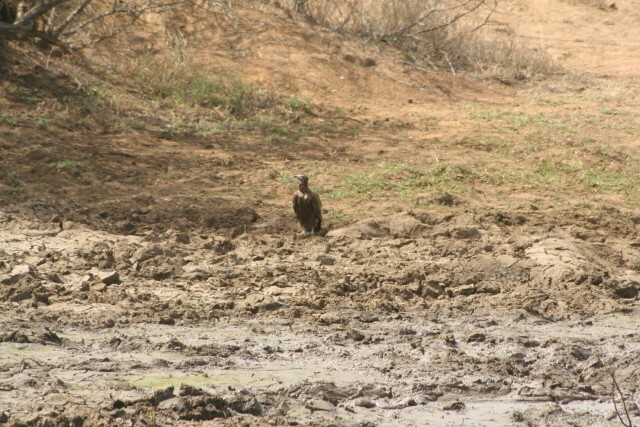 Close to the lion lying in the mud was a Hooded Vulture. This small brown vulture seemed to be nervous. It was alone. 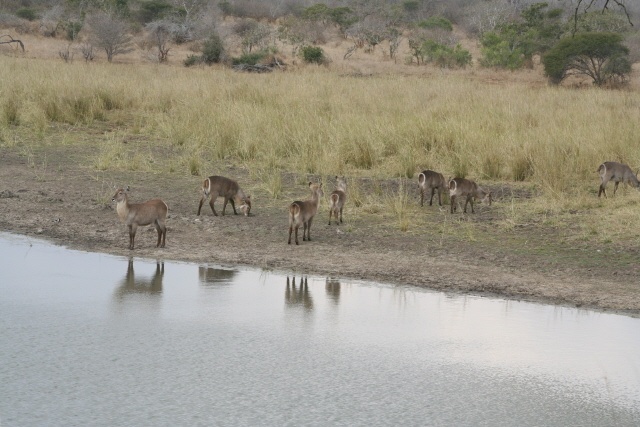 Not far from the lion sighting was a small pan with Kudu and a solitary Waterbuck. After watching for a while I turned around and headed south again towards Tshokwane where I would take a short break. The amount of traffic was quite high and I wondered once more why on earth do the cars stick to the main tar roads rather than drive the beautiful serene and quiet sand roads that abound in the Park. 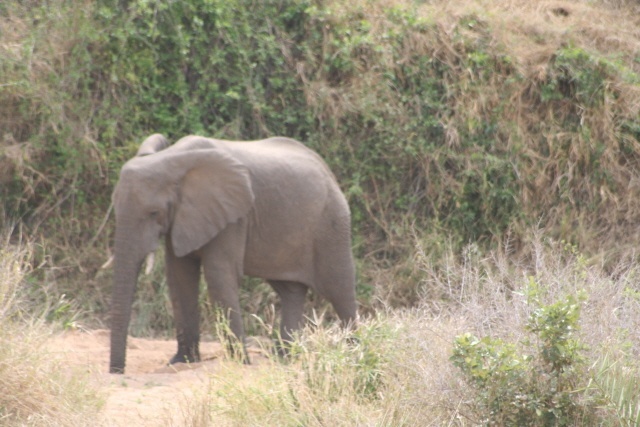 A little further down the road there was a lone Elephant drinking from a hole he must have dug in the river bed. Remember the name of this river is the N’Waswitsontso which means “a river that flows intermittently before disappearing but continuing to flow under the ground”. I have often read about this behaviour and seen evidence of the holes but this was the first time I had ever witnessed an Elephant actually behaving like this. 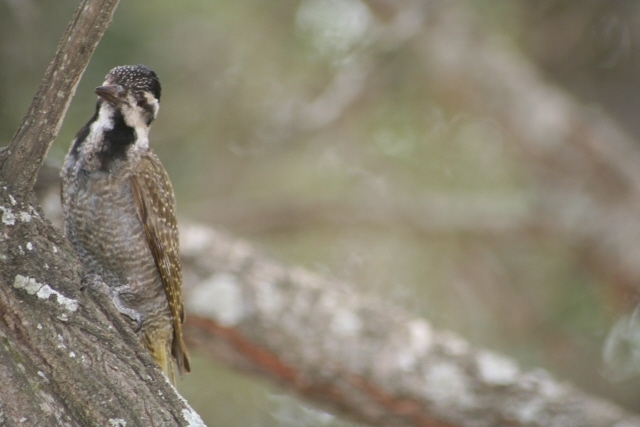 n the Tshokwane picnic area I saw a Bearded Woodpecker and shortly after leaving a pair of Coqui Francolins with the female making the noise “coqui” crossed the road very close to my car. 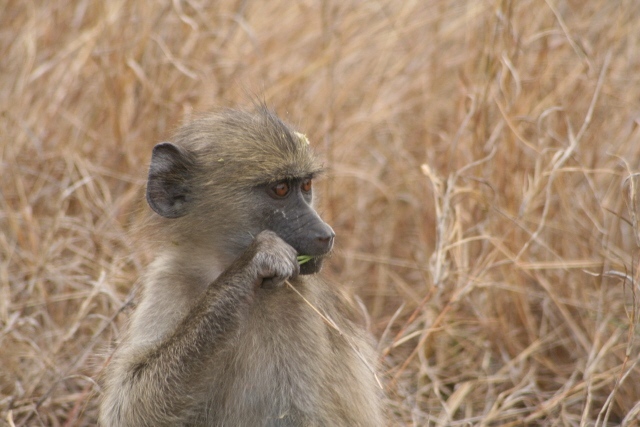 It was also in this area where I managed to get one of the “isn’t it sweet photos” of a young Baboon. I must admit it was sweet … Then I started the fairly long leg to Pretoriuskop. It was 2.30.